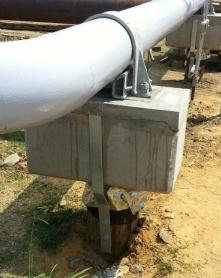 Pipe supports are used to secure process piping and prevent harmful vibrations. The goal of a well-designed pipe support, for vibratory service, is to minimize vibration at the support. This mainly depends on the support’s stiffness and location. See Figure 1 to Figure 3 for examples of typical pipe support systems. An accurate stiffness for the pipe clamp system is essential to determine the natural frequency of piping, which indicates a possibility of high vibrations. The natural frequency of piping varies with the spacing between supports and with the stiffness of the supports themselves. Pipe supports also affect the results of a Piping Stress Analysis (also called a Piping Flexibility Study or Thermal Analysis). The same stiffness value used to determine the natural frequency of piping can also be used in a flexibility study to determine the piping stress and deflection, restraint reaction forces, and nozzle loads on equipment. An industry-wide problem exists due to incorrect assumptions about pipe support stiffness. The current practice by many engineering firms is to assume a pipe support is rigid (e.g., 1E12 lb/in). In reality, the clamp and support system has some flexibility (e.g., 1E5 - 1E6 lb/in). This means the piping engineer’s assumptions can be over 1,000,000 times stiffer than the actual installation. Higher pipe natural frequencies than would be measured in the field, which may lead to high pipe vibration. Removal of pipe clamps (to solve thermal problems), which can result in high pipe vibrations. Failed pipe clamps and equipment nozzles due to higher than expected pipe deflections and loads. ​The engineering firms do not have the experience/capability to determine the actual stiffness values. For example, specialized finite element analysis (FEA) software is required (e.g., ANSYS) as well as an understanding of how to properly model the stiffness. In an attempt to give the industry guidance as to what stiffness is required for a well-designed support, API 618, 5th Edition, has recommended a minimum stiffness. However, there are no published stiffness values for the different types of clamp designs and different support structure designs (e.g., concrete pier, beam support, or elevated post). This project will investigate the stiffness of different types of clamps and support designs. The sensitivity of the stiffness calculation to installation variations, and sensitivity of piping natural frequency to support stiffness will be briefly investigated during the analysis. Best practices for evaluating and applying piping support stiffness in new facilities, with case studies, examples, standard specifications, and “do’s and don’ts” so piping engineers understand how to design an adequate system – and not end up with poor designs like Figure 4. Many gas plants and compressor stations suffer from poorly designed pipe supports. Incorrect assumptions on pipe stiffness are often used, which result in costly vibration and stress problems. Having access to accurate stiffnesses will greatly improve the piping system reliability. The final report outlines the results and conclusions from this research project. For questions or support, please contact us directly at info.vdn@woodgroup.com. Free webinar: new pipe supports and piping stress modeling techniques for more accurate designs.